Set in the wilds of the high Pennines on the borders of Yorkshire, Lancashire, Derbyshire and Cheshire, Woodhead is not the most heavily populated of areas nowadays. In past times, though, it had been the scene of furious activity on a large scale. There are historic indications of trade routes across the area from as far back as Roman times. In medieval times, pack horse routes from the salt 'wichs' of the Cheshire plain around Nantwich across to Barnsley and Wakefield were commonly used. In 1731, a new turnpike was authorised and the salt trade increased dramatically as a result. Salter's Brook (variously, Saltersbrook) lies on the moors above Woodhead and the name is associated with this trade (Lady Shaw Bridge, an ancient packhorse bridge, has recently been renovated. Existing prior to the turnpike, it has been suggested that the bridge was actually narrowed to prevent travellers avoiding the turnpike and it's tolls). The convergence of routes from Barnsley and Wakefield made this an important place and I have seen it described as a 'medieval motorway service area' but you can rest assured that although the extremely busy A628 passes nearby there is definitely no service area! The railway was to be just the most recent of these trans-Pennine trade routes. First came the idea to link the major cities of Sheffield and Manchester by rail. As with the majority of provincial railways in the UK, the primary consideration here was the transport not of people but of goods. Coal could be transported from the Yorkshire coalfield across the Pennines to fuel the cotton mills of Lancashire and the resulting products would then have easier access to the East Coast ports in the reverse direction. The swift River Etherow, draining the northern part of the Peak District (particularly Bleaklow) had powered many mills in Longdendale. Prior to the coming of the railway, there are records of 112 textile mills in that area alone including those at Vale House, Bottoms Lodge and Torside and a Bleach works at Crowden. The names Valehouse, Torside and Crowden were to become familiar to the many readers of C.J. Allen's books, particularly in his records of the 1948 Locomotive Exchanges where they were used as timing points in an otherwise relatively featureless location. A little over 32 miles separates Sheffield and Manchester as the crow flies. However, gradient as ever provided problems and route planning needed to take this into consideration. Although we may, in the 21st Century, regard the distance as small and the height of the intervening hills as very modest (the route summit at Dunford Bridge is only just over 1000ft above sea level), when the work is done by men and not machine other factors come into play. Not least among these, of course, was the capacity of the locomotives of the time to haul loads up gradients. Eventually in September 1839, two months after the original surveyor resigned, work was started in earnest on the last link in the railway joining Yorkshire coal to Lancashire mill. The first section of the Sheffield, Ashton-under-Lyne and Manchester Railway was opened for public use on 17th November 1841, stretching from Manchester (Travis Street) as far as Godley (roughly 8¼ miles). At this time, the population of Manchester had grown to 235,507 (1841 census) and there was a pressing demand for clean water. Where else close at hand, with plentiful water, but Longdendale? 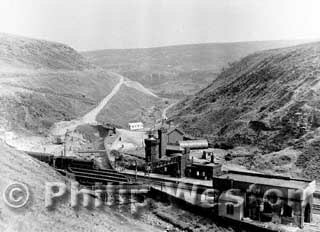 Hence, almost concurrent with the railway pushing up the valley, thoughts were forming for the building of a chain of reservoirs (started in 1848, completed in 1877). Unlike the railway, the reservoirs are still in use to this day. While these reservoirs may have had little influence on the construction of the railway at this stage, a century later matters were quite different (see footnote) . To the bowels of the Earth. Originally planned as two single bore tunnels piercing the Pennine ridge, for cost reasons this was initially commuted to a single bore. But first it was necessary to make more than four miles of cart roads from public roads just to get the necessary materials on site to even start work. 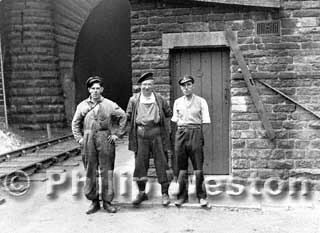 The isolation of some of the work sites also called for the construction of stabling and some form of accomodation for the workers. Of these, there are numerous varying reports with the consensus seeming to be that there were 'up to 1500 workers involved in the construction'. This may have been the case, but the boring of the single tunnel itself presented limitations because of the size and it seems likely that fewer than 400 were actively involved in the tunnelling. Certainly from 1839 to 1842, the workforce averaged about 400. The plan required a single straight bore, on a rising gradient of 1 in 201 from Woodhead east-north-eastwards through the Pennine ridge to Dunford Bridge. The ground-breaking ceremony took place at Saltersbrook, near Woodhead, on 1st October 1838 by Lord Wharncliffe (Chairman of the Company), following the necessary Act of Parliament the previous year. Work then started in earnest and was to take six years to complete. The specification called for a semi-elliptical tunnel with the springing of the arch (the point where the curved top meets the vertical walls) 10 feet above rail level and the soffit (the highest part of the underside of the arch) 18ft above rail level. Tunnel width at rail level was to be 15 feet. Drainage channels either side of the railbed were necessary, each 18 inches wide and 2 feet deep - sufficient to cope with a substantial volume of water. A tunnel of over three miles in length requires rather more than just starting at each end and digging! Five intermediate shafts, each 8 feet in diameter were sunk from the surfaces of Round Hill (the eastern portion of Pikenaze Moor) and Dearden Moss to provide ten additional tunnelling faces. These shafts reached over 400 feet in depth and had 9 inch pumps installed to assist with drainage. The sinking of the shafts, and driving of horizontal driftways was undertaken by the Railway Company themselves, and in 1842 contractors were appointed to complete the work - a Mr Hattersley taking the western portion and Mr Nicholson the eastern (and greater) portion. Wages are recorded as having been 4/- to 6/- per day (20 to 30 pence in post-decimalisation terms), which were considered generous at the time. Sixty years later, my Grandfather worked as a signalman on the Midland Railway at a 30/- (£1.50) box (ie thirty shillings per week) - this may help to put the tunneller's wages into perspective. The layman may think of tunnelling as arduous boring through solid rock, but in the case of Woodhead this was not so. Rocks encountered included huge millstone grit beds (millstone grit is a coarse form of sandstone), argillaceous (clay-like) shale, milder forms of sandstone, slate and clay. To a greater or lesser degree, these are porous and so water drainage was also a consideration (the fact that part of the tunnel passes under Dearden Moss gives some clue as to the nature of the ground). 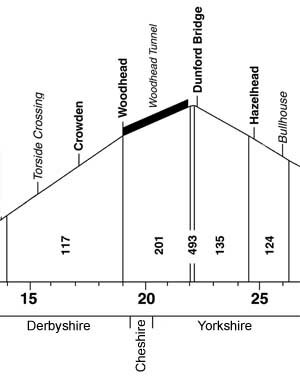 Each of these types of rock has different properties, and different levels of stability, all of which had to be considered both for this, for the second tunnel and, a century later, for the third Woodhead Tunnel. To this end, the entire length of the tunnel was stone-lined to maintain the integrity of shape and to counter the stresses imposed by the sheer act of tunnelling and removing part of the integral strength. The necessity of this was echoed by incidents during the boring of the third tunnel 100 years late (see footnote) . During the operation, it is recorded that 157 tons of gunpowder were used for blasting, over 8 million gallons of water pumped out and nearly 272,700 cubic yards of material removed. 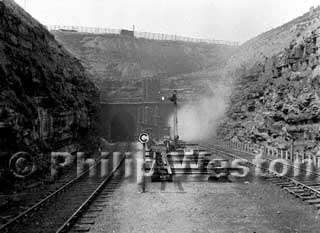 Finally, on 20th December 1845, the tunnel was ready for inspection and was formally opened two days later. The Government Inspector of Railways, General Pasley, expressed his total satisfaction with the work and declared that it was one of the finest pieces of engineering he had ever seen. Traffic could, at last, flow along the entire route. 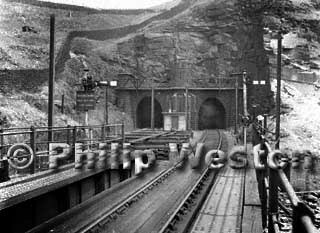 When opened, Woodhead Tunnel was the longest (3 miles 22 yards) railway tunnel in the country. .... the initial plan of two tunnels was almost immediately vindicated as it very rapidly became obvious that the restrictions of a single tunnel, particularly with the rigorous safety precautions installed, created a severe bottleneck. The possibility of this had been taken into consideration during the initial tunneling operations and 25 'manholes' had been positioned along the length of the bore to facilitate the addition of a second tunnel should this prove necessary. It did. Work was started on the second tunnel, immediately to the north of the first, in 1847 and was completed in 1852. This then formed the 'up' road. And thus they stayed for just over a century. Mention was made earlier of the five shafts sunk to provide additional tunnelling faces during initial construction. These shafts were also to provide ventilation. As it turned out, sited as they had been to facilitate tunnelling, the locations proved less than successful for ventilation purposes and, in fact, only two of the five actively ventilated the twin bores. Starting in 1912, No. 2 shaft was doubled in diameter to 16 feet to assist with the problem but the topography of the land mean that there was still a problem. It used to be said that the tunnels had an odour "all of their own, like cheap port". As a boy of about five years old in the early 1950's, I wasn't in a position to draw that conclusion personally (!) but have quite vivid recollections of the 'Woodhead smell' (strange how some things stay with you forever!). In light of the volume of traffic between the new, 'state-of-the-art' marshalling yard at Wath-upon-Dearne and the Lancashire customers for the coal, ways of increasing the volume of traffic safely were considered. One idea in particular is recorded - the installation of a signalbox inside the tunnels. The idea of this was that it would then be possible to have two trains on the same road simultaneously - an idea which raised it's head again fifty years later (see footnote) . However, although I can find no record of the start of this service, the box (installed in No. 12 manhole) gave additional control over the up road. It was certainly in place by 1902 but was abandoned seven years later. Insuperable problems included the difficulty of seeing the signals (the tunnels never, ever, cleared of smoke completely) and the fact that the signalman had the utmost difficulty in seeing the tail-light and couldn't then vouch for the integrity of the train. Engine crews also reportedly had difficulty in restarting on the 1 in 201 gradient. Apparently, it also proved 'difficult' to find signalmen to work the box, even on a shortened shift of six hours. For many years, there were on average 80 or more trains per day in each direction (one each way every 18 minutes). 90% of these were goods trains, either coal to Manchester or empties/produce back to Yorkshire. The exhaust from these heavy trains took it's toll and the tunnel lining started to deteriorate. This was most noticeable in the loss of mortar from between the stones of the lining and became, in the immediate pre World War 2 years, a serious problem. With the volume of traffic on the line (although at the turn of the 20th Century, the line became the northern part of the Great Central Railway, it was always over this section that the greatest volume of traffic ran), weekend possessions by Engineers could not hold back the deterioration for ever. Eventually, the major step of granting total possession of each tunnel alternately was taken. This operated for nine months and still proved totally insufficient. The cost to the Railway Company of diverting trains over other companies (this was pre-nationalisation) rails must have been immense. In 1936, the possibility of a third tunnel had been mooted. Eighteen years, a World War and a change of ownership later and this was to become fact. 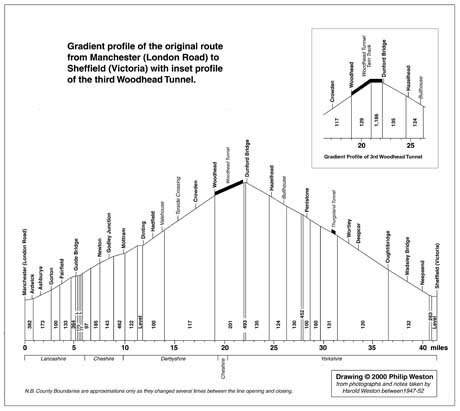 ** Further information on this can be found in the article " Woodhead - the third tunnel "